Privileges govern functions that a Power User can perform. Power Users (PUs) have the same Collaboration, Personal Settings, and Viewer Access Privileges in those Groupings as Regular Users (RUs). Folders (when also has the "Personal Settings" Grouping's Privilege "Create Folders"
Power Users that create an object automatically receive Edit Access to the object. Some objects have Use Permission that allows a PU to utilize the object when creating other objects; e.g., Data Sources, Data Collection Triggers, Data Dependencies. Other objects offer View Access that allow a PU to "see" the content; e.g., Elements, Datasets, Categories. 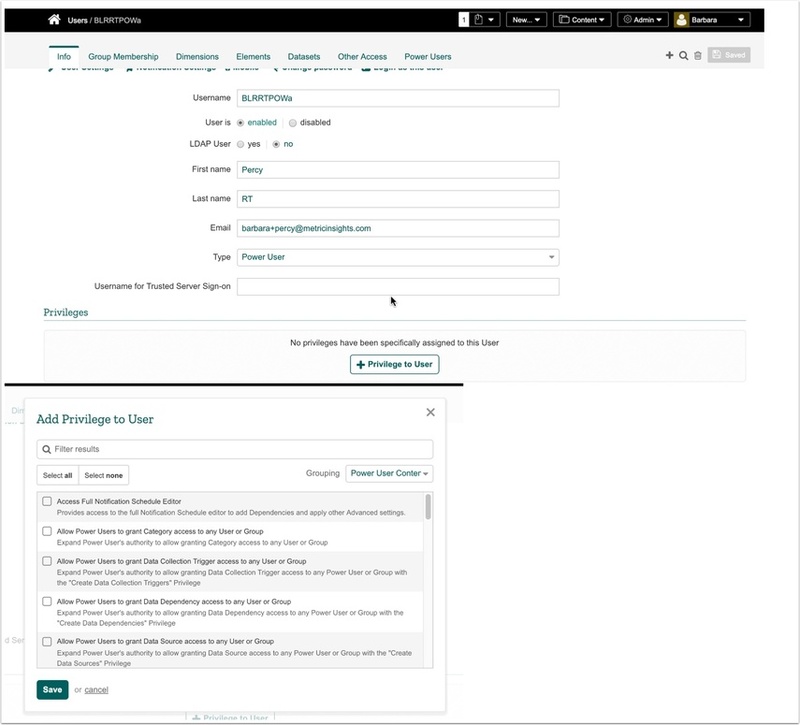 Edit Access allows the PU to access the object's Editor and, in most cases, grant access to Groups or individual Users. On the various tabs of the Group and User Editor or on individual object Editors using the Permissions button > popup, Use or View or Edit Access can be granted to or inherited by a Power User.